I love cranberry sauce with my Thanksgiving turkey. Late last night (Thanksgiving eve), as my Sweet Potato with Toasted Pecans was baking in the oven, I asked R. if there was going to be cranberry sauce at Thanksgiving dinner. He wasn't sure, so I volunteered to make some using another recipe I saw in China Millman's article in the Post-Gazette. After all, the recipe only required three ingredients (fresh cranberries, sugar, dry red wine) and between R.'s mom and I, we had all three readily on hand. I thought the sauce turned out well, especially with the turkey. The cranberries themselves remained quite tart, and I wonder if I could have used more sugar (I used 1-1/4 cups of raw sugar) and let the cranberries cook a little longer. I might play around with this one again and see if I can get the right amount of sweetness going, but for today, I was happy with it. 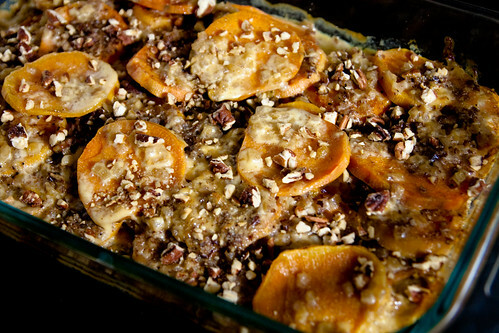 Also check out the Sweet Potato with Toasted Pecans I made and photos of other dishes at our Thanksgiving dinner. I was asked over the weekend, just as I was getting ready to do my grocery shopping for the week, to bring a vegetarian dish to Thanksgiving dinner. 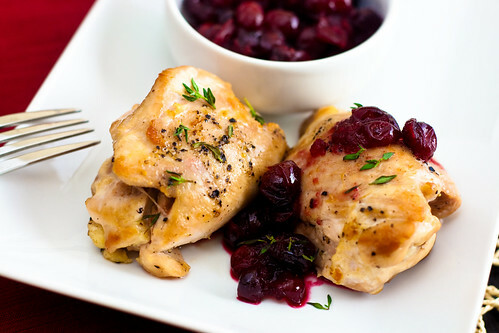 Due to some family health issues, I was anticipating an extremely hectic and unpredictable few days leading up to Thanksgiving, so I had to scramble quickly to find an easy recipe that I felt I could tackle with the limited time I had. Luckily, I recalled seeing a China Millman article in the Post-Gazette a few weeks ago that featured Thanksgiving recipes by several local chefs. I skimmed through the dozen or so recipes and decided on the Sweet Potatoes with Black Pepper Fluff and Toasted Pecans, adapted from Chef Chris Bonfil of Avenue B in Shadyside, only without the marshmallow fluff at R.'s mom's request. The list of ingredients is simple yet interesting: yams, olive oil, onion, bourbon (! ), heavy cream, and toasted pecans. I have never cooked anything with bourbon before, and I was very curious as to how this would turn out. I am happy to report that this was a hit at the Thanksgiving table! I might use a little less heavy cream in the future, as I ended up with more sauce than I needed. Otherwise, the recipe was great, even without the marshmallow fluff. Thanks, Chef Bonfili! 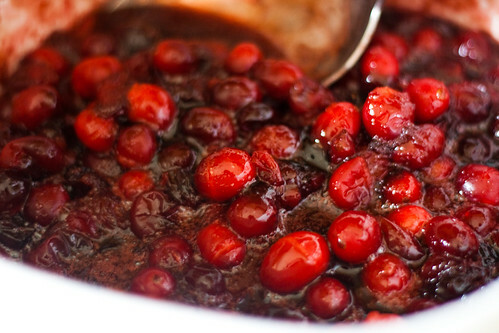 Check out the Red Wine Cranberry Sauce I made and photos of other dishes at our Thanksgiving dinner. 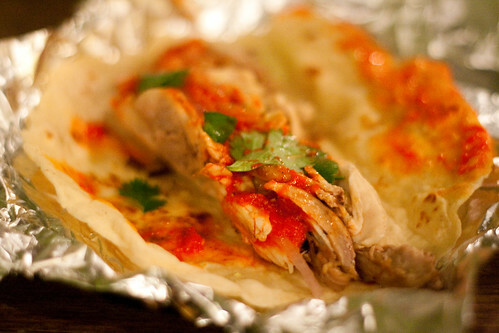 If I had to choose just one word to describe Smoke Babeque Taqueria, that word would be "divine." So far, I have only been to Smoke twice, but I've been more than impressed both times. 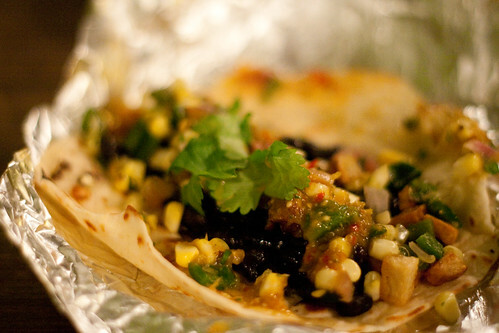 Especially for someone who doesn't normally get terribly excited about tacos. My first visit was prompted by a conversation with fellow food blogger friend Señorita Cibulka, who invited the ultimate Smoke fanboy, Burgh Gourmand, along. The little hole-in-the-wall establishment with just three tables made such an impression on me that when, two weeks later, another food blogger friend, Suburghia Foodie, mentioned she was going to be in the area, I suggested Smoke as the place to grab a bite together. 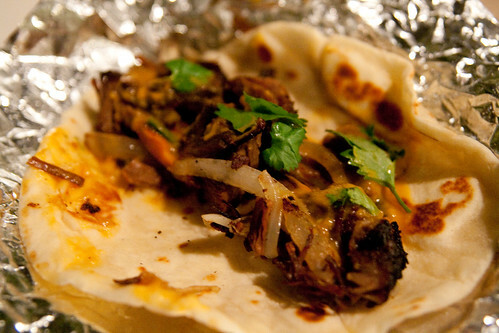 On my first visit, BG recommended the Pork Taco and the Brisket Taco, and I went along. Because the dude is a cook, after all. And I think it is generally a smart idea to trust a cook's judgment, at least when it comes to food. And that was definitely a smart move. On my second visit, I wanted to try two other varieties, the Chicken Taco and the Veggie Taco. Each of these tacos was unique and flavorful. The owners, Jeff Petruso and Nancy Carranco, who recently moved from Austin, Texas, make everything themselves - the meat, the tortillas, the drinks. Everything. And ooooh, the tortillas. So soft, with a hint of sweetness. Handmade daily. Just perfect. Best tortillas I've ever had. 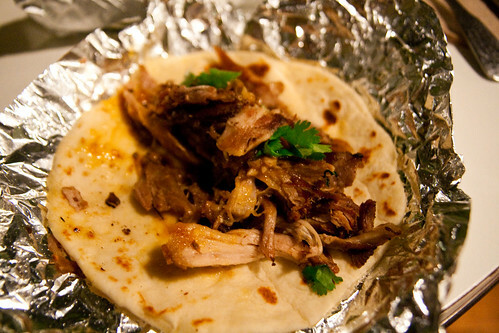 For now, there are only five taco options, which means I have just the Ribs Taco left to try. That said, Smoke is planning to expand their menu, a fact that excites me. During each of my visits, I also ordered a side and a drink. 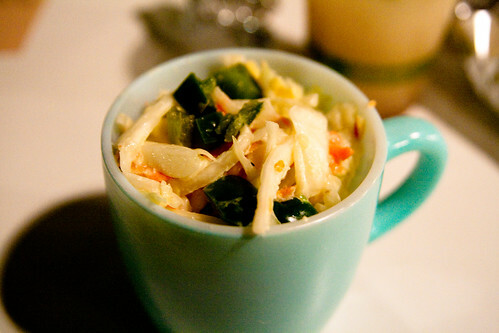 The first side I tried was the Jalapeno Apple Slaw, which was like coleslaw, only far, FAR better. 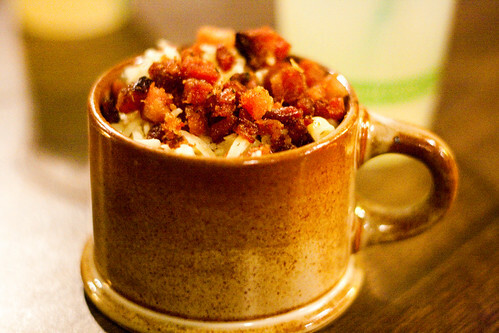 And don't you just love how the sides are served in mugs? The second side I tried was the Mac n Cheese, topped with the optional housemade bacon. This was also a BG-recommendation. I used to think I hated mac and cheese, because when I think mac and cheese, I think Kraft Dinner. But again, a smart gal listens to the one who knows a thing or two about cooking. Sure enough, I was blown away. Smoke's is seriously the best mac and cheese I've ever had in my life. And the housemade bacon? Divine. If you get the Smoke Mac n Cheese, you must get it with bacon. Must. For the fresh housemade drinks, both times I went with something I had never tried before. 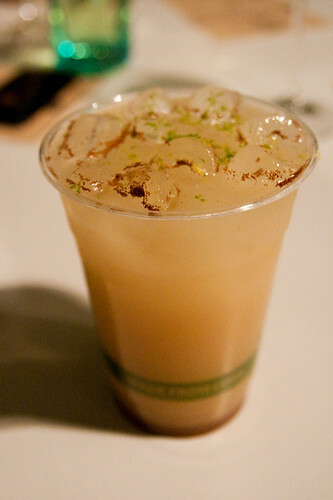 The Horchata is a slightly sweet rice drink with cinnamon, and I liked it. 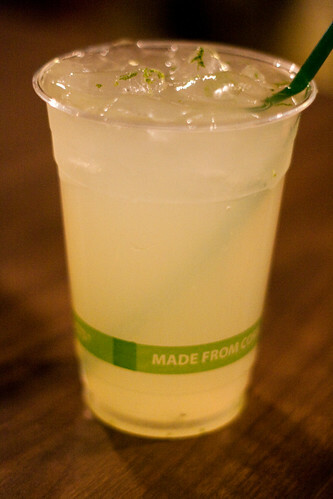 The second time I got the Agua Fresca, which is a refreshing fruit drink. The flavor of the day was honeydew, and I was pleased with it. Austin's loss = Pittsburgh's gain. Needless to say, I will be back. This place is worth the drive to Homestead. Check out related blog posts by Señorita Cibulka and Suburghia Foodie, and also another nice write-up by The JQS. UPDATE 12/21/2011: New post here on a visit after the new menu was unveiled. I had the opportunity to check out Tavern 245 downtown a couple weeks ago. 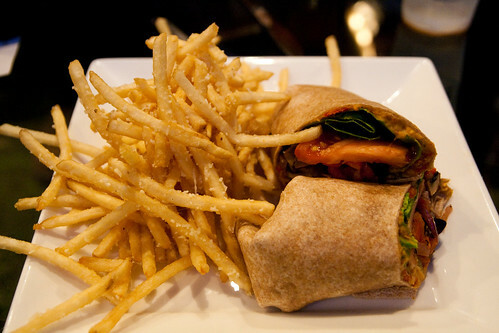 For dinner, I ordered a Spicy Veggie Wrap and a cup of the Tomato Mushroom Basil Soup. The wrap was surprisingly good. The veggies were fresh, the flavors well balanced, and the spiciness did not overwhelm the veggies. 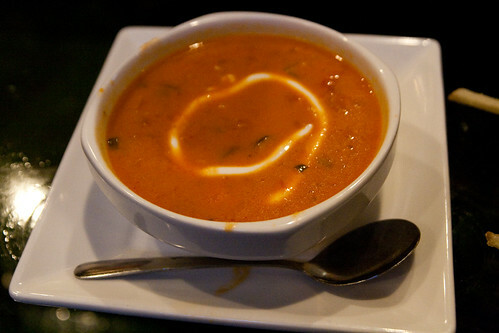 But it was the Tomato Mushroom Basil Soup that stole the show! What a great combination of flavors done extremely well. The portion was also larger than I expected as this was the smaller of the two sizes available. I don't know what else to say about the soup except that it was absolutely perfect. On this night, a representative from Full Pint Brewing was also present, offering several beer tastings. I tried two of them: The Festivus and the White Lightning. I quite liked the White Lightning, which has a hint of citrus to it. And it takes a lot for me to say that I like a beer, as I am not a fan of most beer and only recently started exploring different varieties of beer and learning more about what I like and what I don't like. I'd have to admit, I walked into Tavern 245 not knowing what to expect of the food, but ended up being rather pleased with my experience. I met up with a couple of friends for dinner two weeks ago. They hadn't been to Park Bruges, and while I had been there once, on their opening night, I had been meaning to return, so this was a great opportunity to do just that. The main reason for my very first visit to Park Bruges was to try their Classic Montreal Poutine. Being Canadian, poutine is one of those "tastes of home" that I crave once in a while. 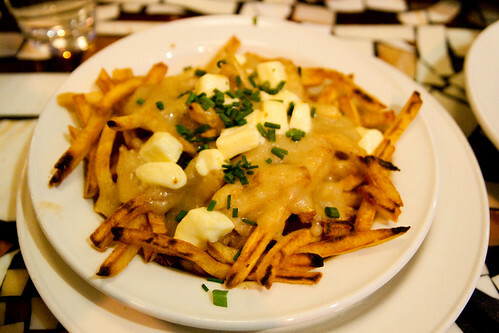 For those unfamiliar, poutine means "a mess" in French and consists of fries drenched in brown gravy and topped with fresh cheese curds - hence, a mess. I don't claim to have any authority over what the perfect poutine should be like, but being Canadian, I do have some idea. My first experience with Park Bruges' version of the poutine was not bad; it was tasty, though it wasn't quite like what you'd find in Canada. They have since changed their cheese provider, now using Cannonball Curds from Arsenal cheese, and I wanted to go back and try it again. Once again, the poutine was also not bad, though it's not really all that messy. :) The fries alone were very good, though probably need to be a little thicker to hold the gravy. I do like the flavor of the cheese very much, but using more cheese and melting it down more would certainly help enhance the messiness factor. The gravy was less flavorful, however, than I remembered from my first visit, and I'm not sure if it was because the recipe has been modified or if it was just an anomaly. Overall, the poutine is decent, but I'd have to say that it's really not exactly "classic Montreal" style as the name would imply. I was also going to order the mussels until my friends said that they had heard great things about the Crab Beignets. I was curious about them myself, so I changed my mind at the last minute and went for the crab beignets. It is an appetizer item, but I figured the poutine would be pretty filling as it is, so an appetizer would be better than an entree as my second dish of choice. 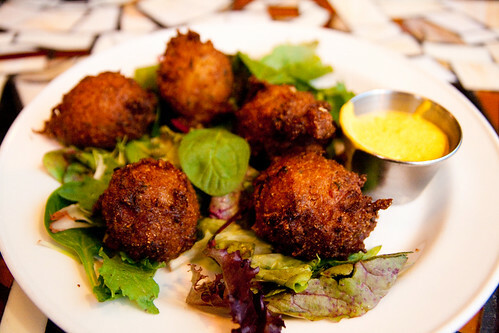 The crab beignets were like mini crab cakes rolled and deep fried. They turned out to be excellent, so I'm glad I decided to try them. Overall, it was a great visit to Park Bruges. I have yet to try its big sister, Point Brugge, and now I'm even more motivated to go check it out soon! ...with pasta from Olio Fresca, that is. Customers are invited to try them by tearing off small pieces of the dried pasta and eating it as is. At $8 per pound, the flavored pasta is a bit of a splurge, but the selection was intriguing I just couldn't resist. 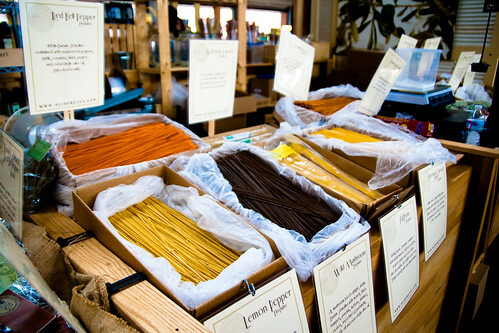 On my first visit, I took home two varieties of the pasta: the Szechuan Orange Linguine and the Wild Mushroom Linguine. Because the pasta is already flavored, it is entirely possible to simply add olive oil and/or herbs for a quick meal. Really quick, in fact, because the pasta takes only about 2-4 minutes to cook. Personally, I prefer my pasta with more toppings. But in the kitchen I'm a bit helpless if I don't have an existing recipe to follow. So...what to do? I tried my best to slap together ingredients I already had with additional ones I thought would complement each pasta flavor. I prepared the Szechuan Orange Linguine (1 lb.) with a pound of shrimp, some broccoli, about 25 cherry tomatoes, and some crushed red pepper for a little heat. With the parsley I have growing at home, I added some as garnish. This yielded about 4-5 servings. This ended up being pretty good, but could maybe use a little bit of a citrusy sauce to bring out more of the orange flavor. For the Wild Mushroom Linguine (1 lb. 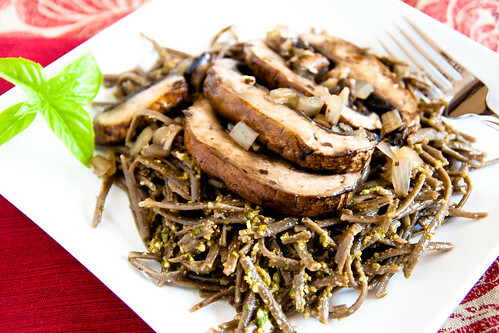 ), I decided to go vegetarian and added sliced portabello mushrooms, onions, and about a 1/4 cup of homemade pesto. There was probably more in there that I can't remember now, but these were the basic ingredients I used. Pesto + mushroom = good! I went back to the Market soon after for more. This time, I picked up some Lemon Pepper Linguine and Sweet Potato Fettuccine. This time, I also resolved to make better notes on how I prepared them. 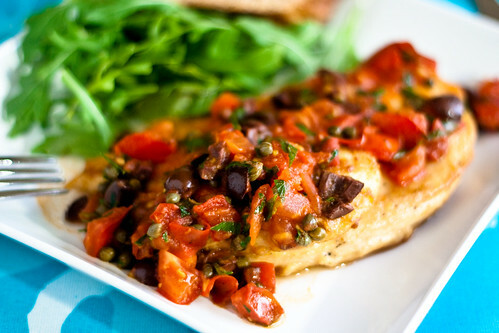 Some of these ingredients were leftover from when I made the Chicken Meuniere with Tomato and Parsley Sauce (capers, olives, white wine) so I made a similar sauce with them adding tomatoes first cooked in olive oil, as well as basil, pesto, and a splash of fresh lemon juice. Then I topped it up with pork tenderloin seasoned with pepper and oven-roasted to 160 degrees. This was a great combo. For the apples, I borrowed a technique I learned from this Curried Apple Couscous recipe. I melted 1 tbsp of the butter in a large skillet along with the cinnamon and pumpkin pie spice in medium high heat. I then added the apples until they are cooked tender, and set them aside. Using the same skillet, I heated up the remaining 1 tbsp of butter, seasoned the chicken with salt, pepper, and cinnamon, and added them to the skillet, cooking them until done. Then I added the heavy cream, cheese, splash of lemon juice, splash of white wine, basil, parsley, and seasoned everything with additional cinnamon to taste. Once the sauce is heated through, I tossed in the cooked apples, and served it with the cooked sweet potato fettuccine. All four varieties of pasta were delicious and all four of my own recipes turned out to be at least above average; most were actually excellent. 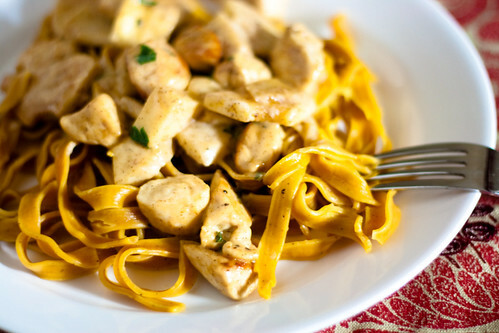 (My favorite of the four was the sweet potato fettuccine.) Maybe I'm actually better at recipe creation than I give myself credit for, but I also think that these all turned out so well because the pasta themselves were great to begin with. Thanks, Olio Fresca! I will be back for more! Update: As of January 2012, Olio Fresca no longer sells pasta in the Pittsburgh Public Market. 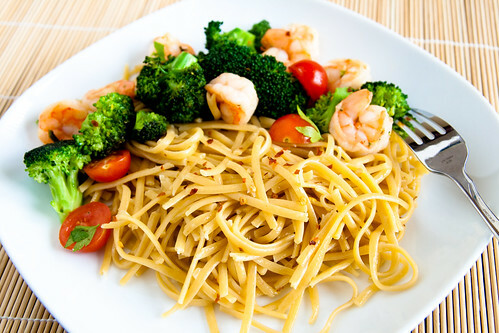 To purchase Olio Fresca pasta, check out their website for currently available products. For other recipes, look here. I don't watch the Food Network (mostly because I don't watch much TV), but once in a while I'd come across a recipe from the Food Network website that looks interesting. This Chicken Meuniere with Tomato and Parsley Sauce by Giada De Laurentiis is one such recipe that looked easy to make and gave me a chance to use up some of my overgrowing parsley. And the result was superb! 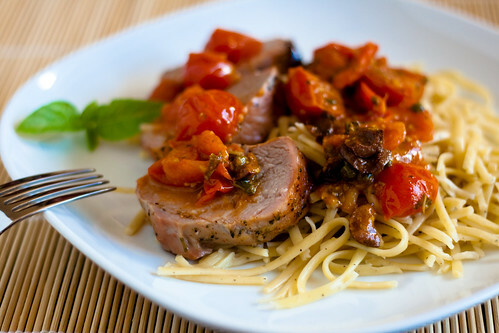 I particularly loved the sauce and have since adapted it to another recipe. 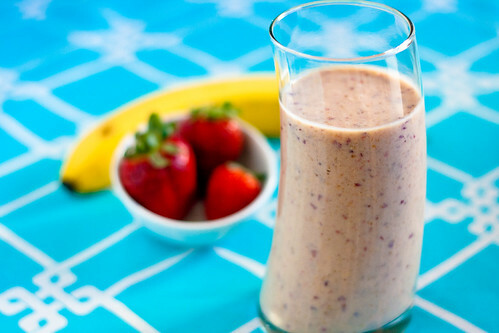 Don't you just love it when you find a recipe to add to your regular rotation? Two weeks ago I attended a special bloggers' preview of the Dormont edition of the 'Burgh Bits & Bites Food Tour, led by Culinary Cory. Dormont - which I learned was the first incorporated suburb of Pittsburgh - was one area of town that had always seemed mysterious to me, if only because I had never been there and knew nothing about it. I was therefore excited for the opportunity to explore a new part of town. 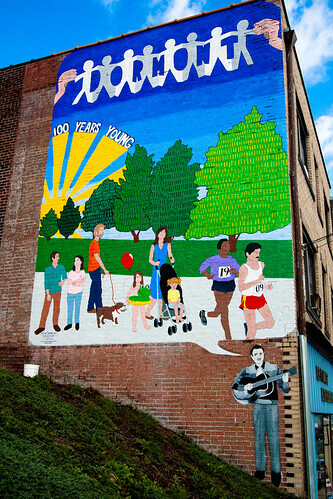 First surprise: According to the 2010 U.S. Census, the mean age of Dormont residents is only 36. For a town that is over 100 years old, it certainly attracts a young crowd! Second surprise: While Dormont is not very big, there is a lot of good food to be had. Below I describe the stops along our tour, but note that some of the stops were specially arranged for this particular visit and may not be on the regular tour. We then hit up Dormont Dogs, which is a hole-in-the-wall kind of place with very limited seating indoors and two picnic tables out front. 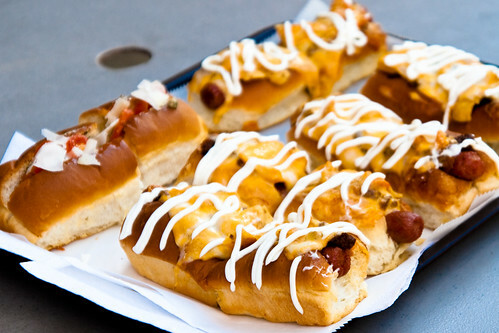 Here, we got to taste the Texas Avenue Dog, which is a chili dog topped with fritos, cheese, and sour cream, with perfectly-toasted buns from Potomac Bakery. And this dog was pretty much ridiculously good. Dormont Dogs was also nice enough to accommodate the lone vegetarian among us with a Bruschetta Dog. This was definitely one of my favorite stops on this tour. 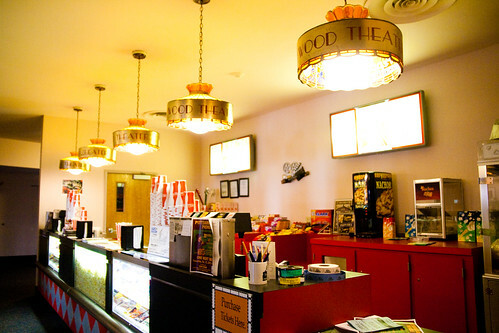 Not a food stop, but we got a tour of the non-profit, community-oriented Hollywood Theater in the heart of Dormont. One unique aspect about Hollywood Theater is that it has balcony seating, and the seats are large and cushy with plenty of leg room. Some are even like sofas. 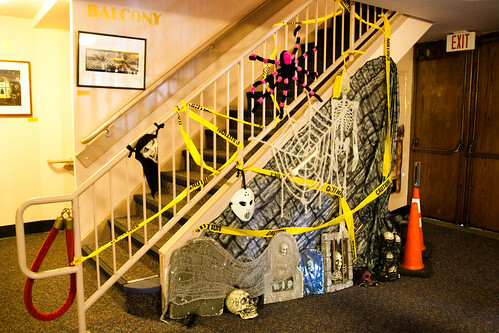 As evidence of its community focus, area high school students were invited to decorate the inside of the theater with Hallowe'en props. There were also displays of art all around the lobby area. 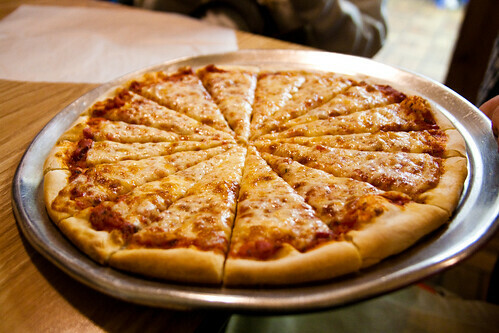 We then headed over to Don Campiti's Pizzeria and had a pizza tasting. Don Campiti's doesn't use plates; individual slices of pizza are served on wax paper, or in a paper bag for a to-go order. Fredo's Market, run by husband-wife team Sadik and Mediha Cehic, was one of the longer stops we had. The little market looks small from the outside, but there is a fairly cozy and spacious seating area in the back that I never would have guessed was there. With free wifi, this could make a nice hangout spot. 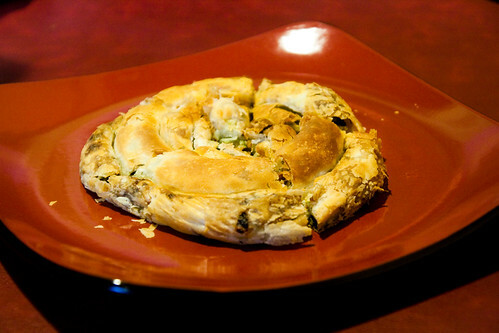 We sat down for our tasting of the Spinach and Feta Pita Swirl, a traditional Bosnian food, homemade by Mediha, including the dough which is stretched thin like phyllo and takes many hours of work. I quite enjoyed this fluffy and tasty pita swirl. Their other specialty is cevapi, which we didn't get to try but sounded interesting. Owner Sadik then spent some time with us talking about their history. He and his wife escaped the war-torn former Yugoslavia in 1994 to the United States to start a new life. He worked tirelessly in the hotel industry and then in the cleaning business until this past year when they saw an ad for the sale of Fredo's Market on Craigslist and decided to fulfill his wife's longtime dream of opening a restaurant. Their goal for Fredo's is to offer a variety of food from Europe, both from their own country and others nearby, and they want customers to feel like they have choices. They also make an effort to support local businesses by using their products such as the buns and meats. It was very interesting to learn about the Cehics' background and hear them talk about their vision; it is clear that they are passionate about their work and grateful for this life they have here. Me, I am grateful that they are bringing southern European culture into our backyards. 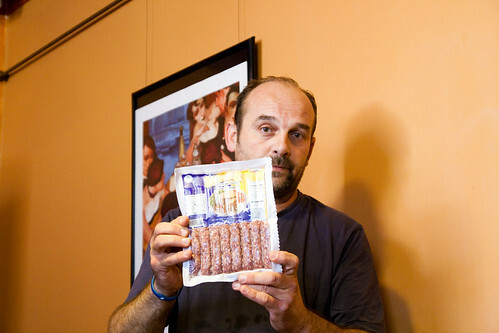 Fredo's Market's owner Sadik Cehic. Our next stop was Sugar Cafe, one place that has been on my wishlist for some time, which also ended up being one of my favorite stops on this tour. Owner Kelly James has been part of the Pittsburgh restaurant scene for 21 years, most recently as Sonoma Grille's pastry chef, before opening up her own shop this past February. In addition to pastries, Sugar Cafe serves up sandwiches, salads, and soups, and offers free wifi. With bread being the only exception, everything at Sugar Cafe is housemade. 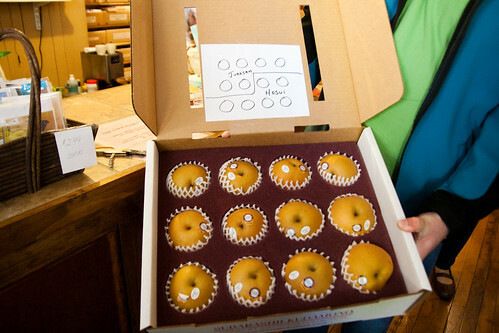 For this visit, we got to select a cupcake for our tasting. 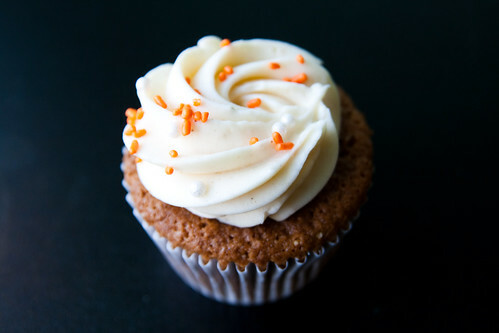 Going along with the fall theme, I picked the Pumpkin Cupcake with Cream Cheese Icing, and it was moist, flavorful, and just plain crazy good. I will be back for sure. Our final stop was a specially-arranged visit to Beyond Bedtime Books, where country music great and Dormont's own Slim Bryant used to teach guitar in the basement. 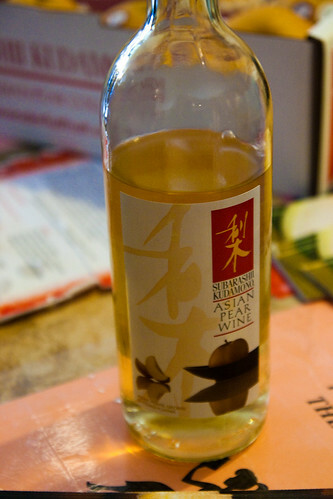 Cory had arranged a tasting for us here of the delicious Subarashii Kudamono Asian Pear Wine, made from Asian pears grown right here in Pennsylvania, and may be found at any Pennsylvania Premium Collection Wine and Spirits Stores. We also got a little souvenir to take home - an Asian pear - which I enjoyed the following day. All in all, it was another fun tour with 'Burgh Bits & Bites. I cannot think of a better way to explore a neighborhood than meeting the people who pour their hearts and souls into their community and sampling their food. 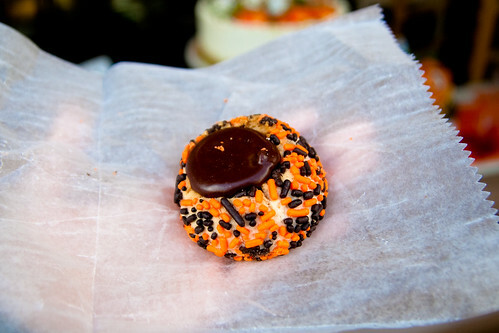 The Dormont food tour is available to the public once a month on Saturdays for $35 per person, but private tours are available for just $31 per person if you can gather six people or more. 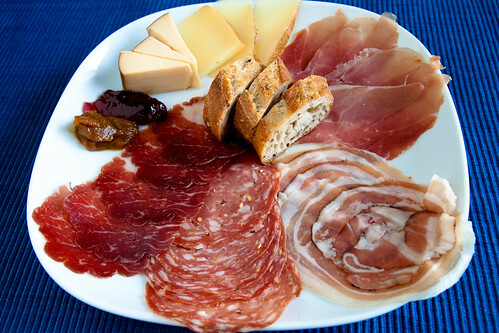 Inspired by the Strip District food tour I took several weeks ago, my meal at Elements, and our trip to Italy back in the summer, I decided to fix my own charcuterie plate for dinner one night. I thought it would be something different and fun, and R. was excited about the idea, so off to the Strip District I went for my meats, cheeses, spreads, and desserts. Parma Sausage was probably my favorite stop during the Strip District food tour, and I specifically wanted to come back here for the meat portion of my charcuterie plate. Along with the really amazing Hot Soppresata, I also got 1/4 lb each of the Coppa Secca, Prosciutto, and Pancetta. The Strip District food tour also introduced me to the cheese counter at Pennsylvania Macaroni Co. With so many options, I wasn't exactly sure what I wanted, but the gentleman at the counter was superbly helpful and offered samples to help with my decision. Because I had to buy at least 1/2 lb of each type of cheese, I only got two kinds: The Smoked Gouda, a Dutch cheese that R. requested, and the Pastore Sini, a sheep's milk cheese from Italy aged in white and red wine that reminded me of the pecorino cheese we had in Italy. I also stopped by The Berry Patch stand inside the Pittsburgh Public Market to check out their jellies and butters. Once again, the choices were abundant and the samples free. I chose the Cabernet Wine Jelly because I thought it would go well with the cheeses (R. absolutely LOVED this one), as well as the Pumpkin Butter because I just absolutely couldn't resist. 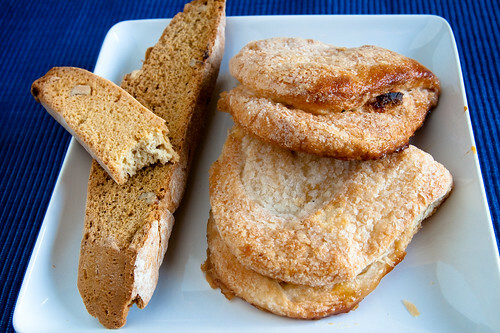 For dessert, I picked up some Pumpkin Walnut and Ginger Almond biscotti at Enrico Biscotti and and Almond Mele and an Apple Mele from Colangelo's Bakery. The end result? R.'s comment summed it up quite well: "You're a good cook even when you're not cooking." Thanks, Parma Sausage, Penn Mac, The Berry Patch, Enrico Biscotti, and Colangelo's Bakery! Dessert. R. ate half of a biscotti before I got a picture. Ugh.